Welcome to our Circus School's web site. So far the Circus School has provided workshops for Nurseries, Primary and Secondary schools as well as special needs schools with great success. But we would say that, wouldn't we? If you would like to check for yourself we can provide you with contact details of schools we have worked for. Size doesn't matter. We have worked in very small rural schools as well as in secure units for young offenders with only 5 pupils. Because we have two instructors we are also able to work with larger secondary schools. Apart from the full day Circus School we have also been booked for special events such as school centenaries/anniversaries, end of term treats for the successful students, Christmas shows and as an alternative to a school outing. FUZZY, otherwise known as Graham, has been performing and giving workshops for over ten years. He officially clowned his way through Glasgow School of Art where he graduated with a BA (Hons) in Fine Art. 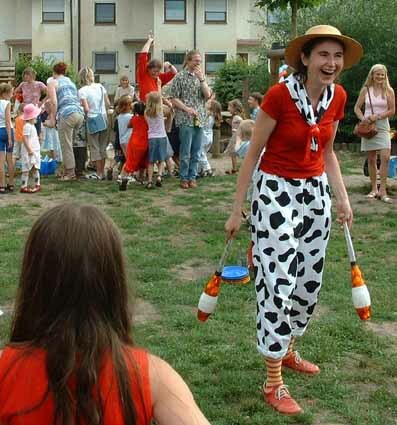 BRITTA, also a very talented performer and experienced workshop co-ordinator, juggled through universities in France and Germany where she graduated with a PhD in Modern Languages. and can produce the Disclosure Scotland Certificate. - We start the day with a show for the whole school. As well as being entertained the pupils participating in the workshops will also be inspired to learn the skills they have seen. Please come back soon, or get in contact with us.